Olesea Zadoinova is a proud member of the BC Society of Notaries, commissioned by the Supreme Court of British Columbia on May 8, 2014. She graduated from the SFU Master of Arts in Applied Legal Studies Program in 2013 and successfully passed the BC Provincial examinations in March, 2014. Olesea is a resident of Coquitlam. She is a married and has two children. 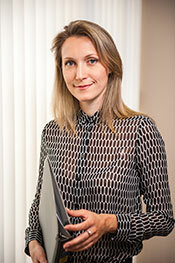 Before becoming a Notary Public, Olesea worked as a legal consultant in the Republic of Moldova for four years. Her main profile was to analyze, examine and elaborate the draft laws, decrees of the President, decisions and resolutions of the Government. As a Notary Public, Olesea is highly trained in the provision of numerous non-contentious services including land law and all the important personal planning tools available to the people of our province - Wills, Powers of Attorney, Representation Agreements, and Advance Directives. Historically, Notaries have been recognized as individuals of impeccable integrity practising in a Tradition of Trust. Olesea Zadoinova cares for her clients and is happy to bring her training and international legal experience to providing Notarial Services to her valuable clients.